​Meet some winemakers who are better with wine than they are with wheelbarrows! The 33-year-old completed her first vintage in France, with a further six in New Zealand as assistant winemaker and operations winemaker at Villa Maria, before moving to the Hunter Valley and taking up a senior winemaking role at McWilliams Mount Pleasant. Her achievements include being named dux of the Australian Wine Research Institute in 2012 and winning Gourmet Traveller WINE's Young Winemaker Medal in 2014 and the Hunter Valley Rising Star of the Year Award in 2015. She was a 2015 Len Evans Tutorial Scholar and also judges at several wine shows around Australia. Most challenging aspect of being a female in a male-dominated industry? I have been very fortunate. Most of the companies I've worked for have fostered the growth of both men and women equally. The most challenging aspects I've dealt with during my career are the blatant sexist remarks from superiors, colleagues, contemporaries and the general public. The shock that the public has when I inform them that I 'am not the promo girl' and 'did actually make the wine' is confronting and ridiculous. What is the best wine you've ever made? The wine that I am most proud of is the 2014 Briar Ridge Dairy Hill Semillon. It was the first wine where I made all the decisions myself, from picking to press method and press cut, to finings, balancing and finishing. It took out the coveted Best Young Semillon trophy at the Hunter Valley Wine Show in the first year that I was at the helm of Briar Ridge. Champagne. It really is a wine for all occasions, whether you are remembering a loved one lost, celebrating one of life's big events or cherishing the every day. What's on your playlist during long hours in the winery? We are a Triple J winery so that is blasting from the moment the roller door of the shed goes up to the time the roller door is shut. Occasionally, I put on a bit of cheesy pop just to switch it up a bit and get the Verdelho fermenting, but that is normally changed back to the radio by the cellar hands. What is the most surprising wine and food match you've experienced that worked? Champagne and hot chips. I have a real soft spot for deep-fried potatoes (which is why I spend so much time running!) and they pair so deliciously well together. The bigger richer Champagnes such as Krug are great with shoestring fries whereas the fresher, linear blanc de blanc styles such as Comte are better with beer-battered steak chips. I don't think I ever really knew. Doctor, marine biologist, nurse, Prime Minister … it seemed to change often! What got you involved in the wine industry? I was studying a bachelor of science in biochemistry and knew that I would never be a biochemist. I didn't enjoy being in a lab all day but did enjoy the practical aspects of science, which is what led me to apply for a postgrad in oenology through the University of Adelaide. I landed my first job as a cellar hand doing all of the dirty work and never looked back. I have since worked my way from cellar hand, to assistant winemaker, to operations winemaker, to where I am today. Eating at one of the great restaurants in the Hunter Valley. Bistro Molines is a great spot for lunch, especially as it overlooks the Dairy Hill blocks. And Muse Dining for dinner. The food and wine matching and dining experience there is fabulous. Is there a female figure in the wine world you look up to or find inspirational? Many! Sue Hodder at Wynns is very inspirational – a great winemaker and always happy to share her knowledge and passions about winemaking. Sue Bell of Bellwether, Sarah Crowe (Yarra Yering), Liz Riley (Vitibit), Liz Silkman (Silkman Wines) are all talented, passionate and knowledgeable women who have a wealth of experience and winemaking knowledge they are always happy to share. Any tips for budding female winemakers? Be physically fit, become a good cellar hand and learn the winery from the ground up. Get dirty. Ask all the questions. Try everything. Remember, if someone tells you 'no, you can't do that' they may be wrong. Don't ever be afraid to take a sideways step if the current job or company isn't working out. Find some good mentors, both men and women, and call them whenever you need them. The 33 year-old commenced her wine journey as manager of a Sydney wine retailer before joining Hungerford Hill as assistant winemaker. Her move to multi-brand stable Agnew Wines in 2013 has since advanced Xanthe to winemaker. In addition to her nomination for the Wine Society young winemaker of the year, Xanthe was awarded the 2016 Hunter Valley Alasdair Sutherland Scholarship, an award recognising young and aspiring Hunter Valley wine professionals. My family used to tell me that 'winemaking is in the blood' because my great-great grandfather was a Frenchman who lived in Paris and had a vineyard in the Côte-d'Or, where he and his sons used to make wine. I certainly know there's nothing else I would rather do so perhaps there is some truth to it. I do regularly find myself as the only female surrounded by men. At this year's Hunter Valley Boutique Wine Show I was the only female judge and in my own workplace I'm the only female in the winery team. To be honest, I have never come across any difficulties as a woman in a traditionally male-dominated industry. I have always found myself to be given the opportunities of my male colleagues and believe that if you are good at your job you will get noticed and rewarded. The 2016 Poole's Rock Chardonnay because it's a style of Chardonnay that I love and I want to make. It uses barrel fermentation, lees stirring and partial malolactic fermentation to give a wine with texture and weight whilst retaining beautiful fruit expression. I never feel guilty about enjoying wine and I don't believe in keeping wines for special occasions. Any day is special enough to enjoy a good bottle of wine. As long as everything is running smoothly in the winery I don't mind what music is playing, as long as it's loud. A winery favourite is Rage against the Machine's Killing in the Name. Any budding winemaker should be determined and passionate. It may seem hard to 'get in the door' and be noticed sometimes, but it is an industry that is incredibly rewarding. There wasn't anything specific but I did know I never wanted an office job. I wanted to find a job that I loved and that didn't actually feel like work. For me, it's driving to work in the early hours of the morning during vintage. The sun is rising and the whole valley is a hive of activity. Liz Riley, owner and Viticulturist of Vitibit, for her extensive knowledge of the Hunter Valley vineyards. Brisbane-born Kate, 28, moved to Adelaide to study viticulture and oenology then worked vintages in McLaren Vale, the Grampians, the Hunter Valley and the Okanagan Valley in Canada, before taking up the position of assistant winemaker at Balnaves in Coonawarra. She then moved to the Hunter Valley with her Cavador (Labrador x King Charles Cavalier) Winston, to work at Brokenwood. I guess it depends at what point you asked me. I fluctuated between Olympic dressage rider, vet, and architect but I decided in year 10 I wanted to be a winemaker so that was quite early! I have been really lucky to have had some excellent mentors, both male and female, to help me get my start. As a result, sometimes the hardest thing for me is to remind myself that not everyone has had such support and that a lot of the women I admire have had to work very hard and fight a lot of battles to get us to this point. Realising how I can help other women get recognised and involved in the industry is something I really try to keep front of mind. Haha, that's like asking who someone's favourite child is! The wine that I have learnt the most from is probably the 2016 Brokenwood Tallawanta Semillon, which has gone on to do quite well in some wine shows as well. The great thing about winemaking, though, is that every wine is different and each has their own challenges and rewards. Whenever there is a bottle of our Indigo Vineyard Chardonnay open in the lab I always try to take it home to finish off! My playlist normally gets fairly quickly turned off by the boys! I love throwing on some old-school stuff – Nina Simone, Marvin Gaye, Al Green, and Otis Redding are all regulars. David Bowie has been getting a good run also. The National is always my fall-back though. A tradition at Brokenwood at the start of each vintage is natural oysters with our Semillon in place of a squeeze of lemon. It works a lot better than I expected and is quite addictive! Both of my parents enjoy their wines and so it was always present at the dinner table. That, alongside enjoying studying the sciences, not wanting to work in an office, and wanting to do something that people appeared to get really passionate about all added up to winemaking for me. After a long day tasting wine at work it's very easy to stop in to Goldfish for a gin and tonic. I finally went and visited Usher Tinkler's cellar door the other day and ate approximately my body weight in cheese and salami alongside a tasting of their wines, and the view (and wines!) from Audrey Wilkinson's cellar door is a must for impressing visitors. I haven't been up in a hot-air balloon or a helicopter over the Valley but I am dying to see it from up there too. There's so many! Samantha Connew (Stargazer Wines) helped me get my start in the industry and helped open my eyes to the virtues of the Hunter Valley along with Sarah Crowe (Yarra Yering) and Gwyn Olsen (Pepper Tree, Briar Ridge, AND Tallavera Grove). 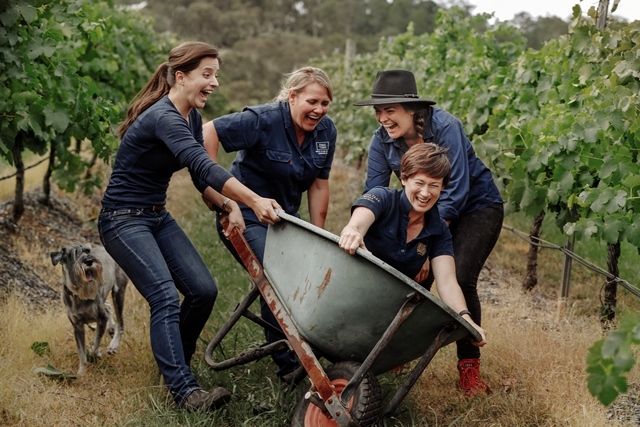 Melanie Chester (Sutton Grange), Sue Bell (Bellwether Wines), Kat Barry (Brokenwood) and Liz Riley (Vitibit Viticulture) are all killing it at what they do and making an awesome contribution to the Australian wine industry. Just get involved! Get your hands dirty. The industry is open to everyone and it will give back to you whatever you put into it. It's a very special thing to be able to say that you love what you do for work. Liz, 38, worked as a lab assistant at Brokenwood Wines before majoring in winemaking at Roseworthy College in Adelaide. She was winemaker at Tempus Two and Roche Estate and now makes wine for First Creek and her own label, Silkman Wines, as well as being a contract winemaker for around 20 other labels. Liz has won the Hunter Valley Winemaker of the Year twice (2011 and 2016), was Dux of the Len Evans Tutorial in 2006 and is a respected wine judge. I've always loved animals – today I have two Staffordshire bull terriers named Jack and Chilli – so from an early age I dreamed of becoming a veterinarian. I grew up in Cessnock and while studying for my bachelor of science at Newcastle University I got a job at Pepper Tree Wines in sales (I wasn't a very good salesperson I can tell you!) and through the small and supportive Hunter Valley wine industry, I heard of a lab assistant role at Brokenwood Wines, which was more up my street. Difficult question as I don't feel that it is so male-dominated anymore, but I know stats will disagree. I simply get on and do my job, running my own brand and the largest winery in the Hunter Valley. 2014 Silkman Chardonnay, which my husband Shaun Silkman and I made together. In 2015 it was named top wine at the annual James Halliday Chardonnay Challenge where 960 wines from 60 wine regions were judged. We were ecstatic about that! White Burgundy (Chardonnay) is my favourite wine in the world. It's expensive so I only get to drink it on really special occasions. If it's a no-expense-spared occasion it will be a bottle of Bouchard – my all-time favourite. Oh that's a difficult one as I love simply matching where the wines just sing. Boring but true – seafood and Hunter Valley Semillon really are a match made in heaven. If you haven't tried it, you don't know what you're missing out on. Lunch with great friends at a restaurant that let's you stay from lunch to dinner. The Cellar is my go-to spot. So many ... but I have to say Sarah-Kate Dineen from Maude Wines in Central Otago as she balances a young family with running a winery. That sounds like an easy sentence to people that don't walk in those specific shoes ... it isn't! From a wine leader in the industry point of view, it would be Vanya Cullen from Cullen Wines in Margaret River. Get on with it! Work hard and don't want the top job too early; you need to earn your stripes. And stop worrying about 'being a female in a male-dominated industry'. That is so 10 years ago. I also believe some younger winemakers need to learn the old lesson, 'it is amazing what you can learn if you shut your mouth and open your ears'.